The main features of KO are automatic UI change when data model update, declarative bindings and trivially extensible. KO is free and open source. It supports event-driven programming language. Easily create complex dynamic user model. It supports all mainstream browsers (IE , Firefox, Chrome, Safari and others). It is very compact in size. UI dynamically changes when user model updated. Observable: It is used to declare your model properties. Whenever the property is updated with UI and new value then the property dependencies will automatically changes the UI and new value. Computed: It is used to computed two or more observables into one. You can join the two observables, make calculation for observables like percentages, age. The 'data-bind' attribute will detects the changes and update the view automatically. The main advantage is no need to change the view. There are many bindings for handling text, arrays and forms. text: It is used to display the text value of your parameter. visible: It helps you to enable or disable the UI element based upon the value passed to it's bindings. foreach: It is used for looping over the array. This is especially useful for rendering lists or tables. <tbody data-bind="foreach: users"> // Looping array!! If/Ifnot: It is used to check the values only when if a specified condition true or false. value: It links with the UI's element value with the property on your viewModel.When the user edits the value in the associated form control, it updates the value on your view model. Likewise, when you update the value in your view model, this updates the value of the form control on screen. Create new MVC5 application using VS2013. First you have to add Knockoutjs library to your application by downloading library from Knockoutjs.com or use 'Manage nuget Packages' (search term 'knockoutjs'). After successful package install, you will find two scripts in Scripts folder like below. 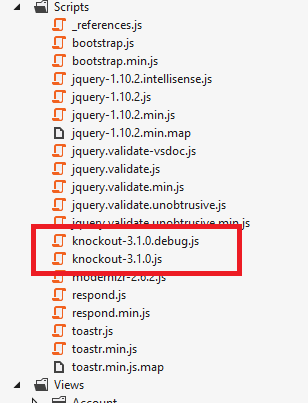 Then we have to add below Knockoutjs script in the 'View'. Now, write down your view.